Why do toy companies do it? Why do they make the toys, statues and other collectibles we want most, and then release them only at the San Diego Comic-Con? Is Satan involved? If so, let's make a deal, because we want these 20 exclusives from this year's Comic-Con bad. You don't need our specific souls, right? This year is the 30th anniversary of the Transformers, and Hasbro is celebrating the robots in disguise at Comic-Con with this incredible set of Optimus Prime, Megatron, Soundwave and "smooth Jazz" as an '80s hair band, complete with animal print-spandex paint jobs and long hair. 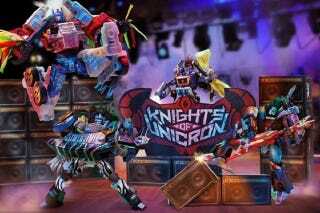 They're the Knights of Unicron, and $185 gets you the band, their transforming instruments, the tell-all "history" of the band, and more. Funko revealed nearly 100 different exclusives for this year's Comic-Con. It was way too many. But still, none of them matched the awesomeness of their Ghostbusters exclusives, with included a slimed Venkman with Slimer, a glow-in-the-dark 6-inch Stay-Puft marshmallow man, and this, a four-pack of the Ghostbusters post-Stay-Puft-battle. When Homer Simpson designed his ultimate vehicle, the joke was it would never be made. And yet here it is, from its horn to its bubble domes, as a Hot Wheels car. Mattel's $30 set includes special packaging that presents the car in a 360-degree rotating display, and when opened, the box sounds off The Homer's iconic horn honk ("La cucaracha"). There's only one place to get movie-accurate Teenage Mutant Ninja Turtle figures — no, not the new Michael Bay movie, I mean the original 1990 movie! That's with Toys "R" Us' special edition of Playmates TMNT Classics figures, which are perfect recreations of Jim Henson Productions' original Turtles, and have 34 points of articulation to boot. All you need is Corey Feldman's voice! Although Toys "R" Us exclusives, they'll be sold at the Entertainment Earth booth. Bobbleheads aren't for everyone. But I have to imagine the Venn diagram of people who enjoy Bobbleheads and people who understand that Entertainment Earth's exclusive Bobblehead of Data and Geordi from The Next Generation dressed as Sherlock Holmes and Watson from the "Elementary, Dear Data" episode are completely awesome is pretty much the same. Take these two brilliant, nodding badasses home for $30. Using the universe's most dangerous prison to play Yahtzee?! It's… it's exactly the sort of thing the Doctor would do, actually. USAopoly's fully customized game includes translucent dice with Roman numerals, a Pandorica-shaped dice shaker and more, for $20. There have always been tons of Godzilla figures, but Bandai's 60th anniversary figure of Godzilla puts the King of the Monsters in his natural habitat — the destroyed ruins of Tokyo. This $60 set folds out to reveal the destruction, and Godzilla himself is deco'ed with a glowing spine, indicating he's in mid-atomic breath — and there's more destruction yet to come. Given how cheap the Power Rangers always looked on TV, it seems to weird that the show would now have high-end collectibles. And yet it does, because Bandai is bringing this amazing replica of Tommy's Dragon Dagger to Comic-Con which is life-size, includes die-cast parts, includes the original's flute keys, and more. Basically, for $150, you get a Dragon Dagger that does everything the Green Ranger's did on the show… except for summon a Zord. You've seen Dark Horse's 3-inch figures of Daenerys' dragons Drogon, Rhaegal and Viserion; I'm sure they'll be quick sellers. But you have a more discerning eye, and you know that the most badass Game of Thrones item at Comic-Con is the House Bolton map marker replica for $25. Not only is it show accurate, like the one Robb Stark used to plan his battles against the Lannisters, it's of a flayed man — the Bolton house sigil. Whether you're adding it to your GoT replica map set or using it as the world's best conversation piece, it's a must-have. There's a lot of Guardians of the Galaxy merchandise represented in this year's Comic-Con exclusives, including busts, crazy vinyl toys, mugs of Rocket's severed head, and more. But we think this 10-inch plush from UCC best embodies the huggable nature of Marvel's most trigger-happy raccoon. UCC will only be selling 400 of these per day (at $20 each) so don't dawdle if you want one. Not all Comic-Con exclusives need to be action figures or statues, and this Harley Quinn pure from Graphitti is the perfect example. It's smart, stylish, and functional — basically everything Harley Quinn is not. The purse is 6- x 4- x .5- inches, comes with a 46-inch adjustable strap, and will run you $22.63. There is a mini-bust of the fat X-Wing pilot from Star Wars. This is a thing that exists, and will be available at this year's Comic-Con. Now, whether you believe this this is a sign of the end times, or if you need to buy it to remind yourself daily that you live in a world where owning a Jek Porkins minibust is possible, it's an astounding item. Head to the Gentle Giant booth with $85 to pork out (sorry). Remember Super7's amazing, '70s Kenner-style Alien movie action figures from last year's Comic-Con? Well, with help from Funko, they've made an amazing, '70s Kenner-style Alien movie playset of the egg chamber where Kane gets his face hugged! Alas, you can only pre-order the playset at Comic-Con, but time (and $100) is a small price to pay for a toy that has effectively been brought to us from an alt-history past. WETA is weirdly low on exclusives this year — I guess they're all busy cranking out CG for the third Hobbit movie — but they did have time to design this fantastic T-shirt, replicating Smaug the Mighty's scaled body — complete with the one missing scale that will prove his undoing. The $40 is subtly nerdy, which is always nice for geek apparel, but you do run the risk of people continually poking you in the missing scale area, though. You don't have to be a Magic the Gathering fan to appreciate a badass Nerf axe. You probably do need to be a MtG fan to know who the hell Garrus is, or why the six limited-edition Planeswalker cards — including the eponymous Garruk Wildspeaker and his death powers — are going to be in such high demand, though. The axe-and-card set costs $110.99. About 98% of nerd jewelry is obnoxious and gaudy, so any time someone makes classy nerd jewelry, it should be celebrated. Case in point: Quantum Mechanix's lovely gold Firefly keychain pendant, which features Captain Mal's Serenity floating on a small leaf. And at only $14,95, it's a steal that even Saffron would approve of. I'm going to even bother paying lip service to the perfectly fine 3.75-inch figures of Thanos, his brother Starfox, his daughter Nebula, and his girlfriend Death (note: There is now a figure of Death as personified in the Marvel comic universe, and she's Thanos' gal pal). The real point of this $75 Hasbro set is a giant foam Infinity Gauntlet you can wear, beat people with, and use to recreate the universe in your image. Or impress your girlfriend Death, Your call. Natasha Allegri's Bee & Puppycat cartoon is still pretty much the best thing ever, so ThinkGeek could have put out a rock with a Bee and Puppycat logo on it and we'd still be excited. But an inflatable version of Bee's sword for only $10? The only thing we'd want more is more actual Bee & Puppycat adventures. Remember what I was saying about Hasbro doing Transformers right for its 30th anniversary? Well, this set of Age of Extinction's new Dinobots in classic Dinobot colors is an awesome set by itself. But what makes this exclusive a must-own is that it comes with packaging, designed by renowned pop-up artist Matthew Reinhart, which folds out into a giant, amazing replica of the Ark, the Autobots HQ from the original cartoon! It's a playset kids have dreamed of for 30 years, and it's finally here! It's a playset well worth $159.99 — and then you get to pretend it comes with four free Dinobot figures! There is a Deadpool Mr. Potato Head figure. Even the Porkins mini-bust thinks this exclusive is insane. It's only going to be at the UCC booth, and at $20, it'll likely sell out almost instantly. Just FYI.